Burundi is one of the poorest and most neglected countries in the world and today 80% or the population lives on under $1 a day. Hunger and poverty are exacerbated by a dearth of quality medical care, most acutely felt by Burundian women and children. 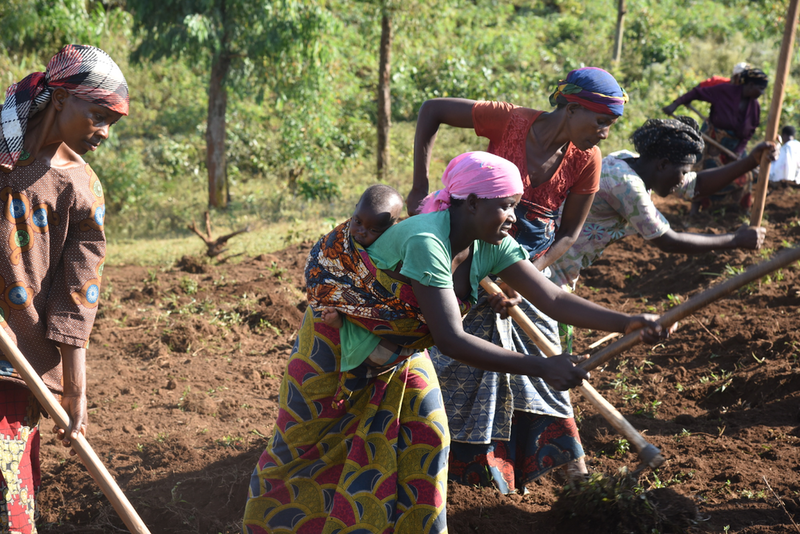 One in 23 women in Burundi will die during pregnancy or childbirth in their lifetime.It is a country that has faced years of setbacks, a brutal colonization, genocide, and political instability. The challenges that Burundi faces would lead many to discount it and its people. We believe this is a mistake. Village Health Works believes in Burundi because we have seen what a vision for change, a strong will, and a community’s passion can do to bring hope and health to a country that needs both desperately. We have seen what happens when enemies put down weapons and pick up shovels to rebuild their homeland. We have seen what happens when you invest in a community and offer people a chance to be part of the solution. Today, Village Health Works is building a 150 bed state-of-the-art teaching hospital on a mountain that just ten years ago was war-ravaged and barren. The Kigutu Hospital, Women’s Health Pavilion will provide essential and emergency obstetrics and surgical care, with a special focus on the health needs of women and children. The story of how we transformed an empty mountain into a bustling campus where hundreds of people receive clinical care, academic instruction, tools for income generation, and cultural reinforcement is truly unbelievable and still being written. Deogratias “Deo” Niyizonkiza, Village Health Works’ visionary founder and president, was studying medicine in Burundi in 1993 when a catastrophic civil war broke out that would eventually take the lives of hundreds of thousands of people. Burundi erupted into chaos and Deo was literally running for his life. Luckily, with help from a contact at medical school, Deo was able to escape from Burundi to New York City. Arriving in New York City nearly penniless and knowing no one nor a word of English, Deo ended up homeless sleeping in Central Park. While delivering groceries, Deo had a chance encounter with a former nun who took an interest in helping him and connected him with a couple who eventually became his surrogate family. Deo knew he had been given a second chance and he seized it. Despite the hurdles he faced both in Burundi and the U.S., he eventually attended Columbia, Harvard and Dartmouth. While at Harvard, Deo met Paul Farmer, the founder of Partners in Health, the medical nonprofit whose mission is building health systems in some of the poorest countries of the world. Inspired by his work with Partners in Health, Deo set out to help Burundi. Deo’s inspiring life story is told in Pulitzer Price-winner Tracy Kidder’s book, Strength in What Remains, a New York Times best seller. The book ends with the birth of Village Health Works and the idea of opening a clinic in rural Burundi. The next chapter of this amazing story is equally as inspiring as the first. In 2001, Deo traveled back to Burundi for the first time in nearly a decade. During his travels he witnessed the squalid conditions of Burundi’s hospitals and knew he had to do something. Deo went back again in 2005 and met with a group of 11 men and 4 women in his village to convince them to donate land to build a health clinic. On December 25, 2005, the community, made up of subsistence farmers, gifted 25 acres of land, their most valuable possession. In the ten years that followed there were arduous setbacks, but giving up was never an option for both Deo and the community. Men and women who years before fought against each other were brought together to accomplish the mission of building a health center. When work needed to be done, the community was there building roads, carrying bricks, and caring for their fellow neighbors. The work became a calling and Village Health Works became a place of healing, reconciliation, fun, and hopeful futures. In December of 2007 Village Health Works opened a health center overlooking Lake Tanganyika and the surrounding mountains. Today, the clinic is open 24 hours a day and serves a catchment area of 200,000 mostly centered in Rumonge, Makamba and Bururi provinces. In 2017 the clinic performed nearly 38,000 consultations for community members seeking treatment for wide-ranging issues such as prenatal care, malnutrition, malaria, diabetes, and depression. A core focus of Village Health Works is women’s health. Complications during pregnancies that are resolved with routine procedures in developed countries are not readily available in Burundi and often lead to death for women and babies. Burundi’s material mortality rate is more than 50 times higher than the U.S. While health is the cornerstone of our work, our holistic model also focuses on education, food security, economic prosperity, and community engagement. Today Village Health Works trains teachers and feeds students, supports farming and livestock co-ops, and sustains community cooperatives programs that help create economic opportunities and provide the tools necessary to lift participants out of poverty. In 10 years Village Health Works have transformed a desolate mountain village empty lot into a bustling, comprehensive clinic. Today, Village Health Works has over 490 full-and part-time employees in Burundi including 70 clinical and support staff and more than 250 community health workers. We employ a dedicated team of 33 teachers in the community who are responsible for 550 students. In addition, more than 1,000 community members participate in regular community service programs. While we are all very proud of what we have built at Village Health Works, there is much more that needs to be done. Despite our growth, the need for safe surgery is dire. The senseless deaths of mothers and children tear the social fabric of our community and leave wounds that last for generations. In response, we have begun construction of the Kigutu Hospital, Women’s Health Pavilion, a 150 bed teaching hospital on our campus that will provide essential and emergency obstetrics and surgical care, with a special focus on maternal and child health. Today, construction of the Kigutu Hospital, Women’s Health Pavilion is in full swing. The foundation, basement, and first floor are complete and the second floor is well underway. We remain on schedule to meet our goal of opening the hospital in 2020. At a fraction of the cost of a similar facility in the United States, the Kigutu Hospital, Women’s Health Pavilion will save lives and reduce needless suffering. The hospital will serve as a health care model for the region and the country, illustrating both what can be accomplished and how to get it done. It will act as a training ground for clinicians, teachers, researchers and leaders, serving as a platform to train and retain the country’s medical workforce. The most important part of our future is building our community of supporters. We are looking for partners who are also willing to believe in Burundi and who will fund the completion of the hospital and be part of our effort to bring quality care to the people of Burundi. Generous donors such as the Bill and Melinda Gates Foundation have helped us raise more than half of the funds needed to complete the hospital. We hope that others will join them in furthering Deo’ vision to help heal a nation.